Listen in to any conversation on our energy future, and you’ll hear about smart grids, solar cells, wind turbines, even energy from algae or from ocean waves. All of these are promising technologies, but we also have a technology that we can fully deploy right now–energy efficiency. Ho-hum as it may sound, energy efficiency packs a punch. Consulting mavens McKinsey and Co. estimate that the U.S. has the potential to reduce its annual energy consumption by 23% over the next ten years through cost-effective energy efficiency measures. That would be enough–by itself–to meet President Obama’s climate goals. But to accelerate energy efficiency, we need to capture the imagination of everyone from the pipefitter in the plant, to the professor in the classroom, to the CEO in the corporate boardroom. Today, GE and Environmental Defense Fund announced a new initiative to help do just that. You may have heard of GE’s internal “Treasure Hunt” process that the company has honed at more than 200 sites since 2005. Originally developed by Toyota, the process brings together workers at different levels, in various kinds of facilities, to quickly identify energy and cost saving opportunities. At the same time, these workers gain a sense of ownership about energy efficiency and are frequently motivated to change their energy-using behaviors. 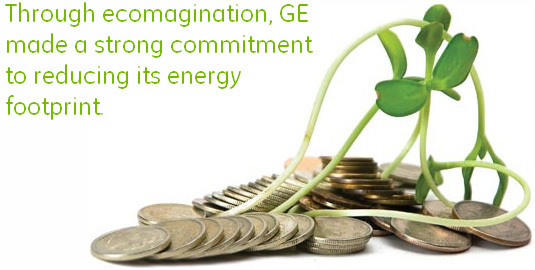 To date, participating GE facilities have averaged a 20% reduction in energy use. Overall the Treasure Hunts have contributed to savings of over $130 million and trained more than 3,000 employees. Impressed by what GE is achieving at its own facilities, the Environmental Defense Fund approached GE last year about sharing this practice more widely. This summer and fall, GE and EDF are partnering with select cities, a university, a hospital, and other types of businesses to help identify energy and cost savings opportunities and train them in the newly renamed “ecomagination Treasure Hunts” process. Together we hope to discover significant opportunities, while inspiring broader action on energy efficiency nationwide. Continuum Health Partners’ Roosevelt Hospital in Manhattan was the first to go hunting for energy treasure earlier this month. In just three days, hospital employees found opportunities for $2.1 million in annual energy savings with a payback of 2.6 years. When implemented, these changes will cut carbon pollution by over 7,500 metric tons annually. Steve Fludder, GE’s Vice President of ecomagination, says that given GE’s record of success, “multiplying these benefits by sharing the practice with others was the logical next step.” Other organizations trying out the process include the cities of Atlanta and Orlando, the University of Illinois, and Merck. Trillions of dollars in energy savings are up for grabs in the United States. While we continue to develop next-generation technologies, let’s not forget about the opportunities that are in front of us right now.